Enrolled nurses who are authorised to administer medicines will be familiar with scheduled medicines. Often prescribed for the management of acute pain, Schedule 4 and 8 medicines such as codeine, morphine, and oxycodone can be administered via oral and subcutaneous routes. 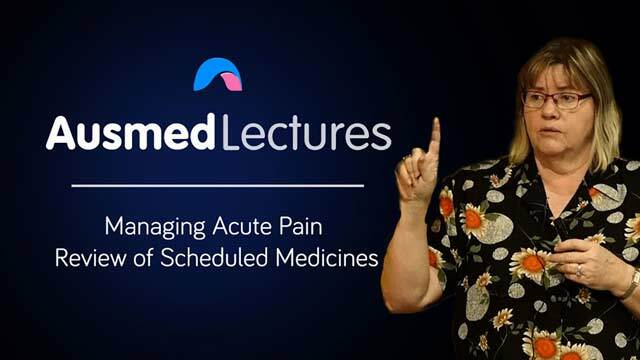 This session has been designed for Enrolled Nurses, to get you up to speed on all recent changes to the scheduling of some of these medicines. Dr Treasure McGuire is a medicines information pharmacist, pharmacologist, educator, and researcher. As assistant director of pharmacy, Mater Health Services, she manages their academic practice unit. She is also a senior conjoint lecturer in the School of Pharmacy, University of Queensland and associate professor of pharmacology, Faculty of Health Sciences & Medicine, Bond University, where she lectures on complementary medicines, reproductive health, medication safety, and communicable diseases. In recognition of her services to medicines information, she received the Lilly International Fellowship in Hospital Pharmacy and the Bowl of Hygeia of the Pharmaceutical Society of Australia. It was a valuable resource but disappointing not seeing the whiteboard the lecturer was referring to throughout the session !I would recommend the session as a refresher for all categories of staff. Very educational especially the in depth side effects and comparative to other analgesics. I like the personal stories shared by the presenter.